Activist volunteers don't consider themselves part of a political movement, but they are changing society nevertheless. Last summer, Moscow resident Anastasia Vishnyakova, 25, realized she could no longer tolerate the trash in the woods next to her home. “Children were swinging on ropes over the gully, which was full of muddy cardboard packaging and broken glass,” Vishnyakova said. “It was simply painful to go into the forest. And there aren’t any trash cans anywhere nearby, so only the most conscientious people didn’t litter and took their trash with them when they left.” Vishnyakova decided she would try cleaning up the area with some friends, and turned to the local branch of the United Russia party for help obtaining trash removal tools and equipment. United Russia, however, gave her the cold shoulder. She then decided to write Greenpeace Russia, which directed her to the public movement No.More.Trash (NMT). She hung up notices and distributed information on social networks. NMT organizers notified the city administration what time the trash would be collected and agreed that a truck would be sent. The organizers also brought their own trash bags, work gear and gloves. The cleanup group ultimately collected 230 bags of garbage in three hours and separated about half of this amount for subsequent recycling. NMT, founded by St. Petersburg residents in 2004, has now ballooned to 50 coordinators and several thousand volunteers in 29 Russian cities. On Sept. 11, 2010, more than 80 groups coordinated by NMT worked to pick up trash in St. Petersburg and the surrounding areas. 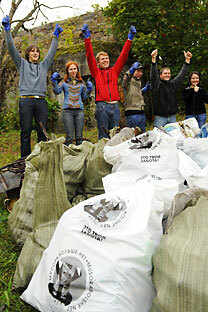 Another 60 cleanups took place throughout Russia in 2010. NMT is a member of the global volunteer campaign Clean Up The World and Let’s Do It! In the Urals city of Chelyabinsk, only 11 people showed up for the first major volunteer cleanup in 2009. By 2010, however, the Chelyabinsk group already had some 500 members and had conducted 23 cleanup campaigns. “In the spring, we organized tree planting jointly with the forest protection service, which helped put the fires out in the forest all summer,” said Viktor Tarasenko, a local organizer. “We broke in container deposit technology at the Pump Battle festival. This technology is still new for Chelyabinsk.” Actually, it is still new for all of Russia, although 10 major festivals so far have embraced this principle. In Chelyabinsk, organizers gave 10 rubles for every plastic cup brought in for recycling by people attending the festival. NMT organizers said more than half of the attendees returned their cups. The environmental events are popular, and are also a good way to meet people. Tarasenko said that the Chelyabinsk branch of NMT had increased by 450 people over a year by combining cleanups with other forms of recreation, such as watching movies at night in the forest, horseback riding and bicycling. Local officials in Chelyabinsk have also been supportive, after Tarasenko found the right one. When the NMT group was getting organized in the city, Tarasenko bounced around government offices until he found someone who was sympathetic to his cause. Lyudmila Matveyeva, one of the NMT coordinators in Moscow, said she hasn’t had any problems seeing eye to eye with the local authorities. Officials have been willing to provide vehicles and work gear in addition to placing advertising in local district newspapers, but a bigger problem is making sure the hard work of volunteers doesn’t go to waste. After Anastasia Vishnyanova and her friends cleaned up their forest, no trash can was set up in the area. The district council was reluctant to pay extra for trash to be collected from this bin—much less set up a container with separate sections for trash and recyclables. In some parts of the United States, households receive points each month from recycling companies for separating their garbage. They can then redeem these points at gas stations, restaurants and stores. In contrast, in Moscow, a recycler must be sure that at least 450 kilograms of recyclable materials will be collected before a truck is sent to pick it up. Otherwise, it’s not profitable to go pick up the materials. In 2008, Greenpeace suffered a setback with its project in St. Petersburg because of a related problem: After the city administration spent 40 million rubles on different colored trash containers, it forgot that they needed to be emptied regularly. But where the city failed, NMT has succeeded. The group set up experimental recycling separation containers in several courtyards in St Petersburg. The janitors who clean the buildings and courtyards notice when the containers are full and then call NMT members, who come and collect the trash. Many of the residents have even become accustomed to sorting the trash. Grassroots groups like NMT, created by volunteers to tackle very specific tasks, don’t view themselves as political movements, but their work makes clear the lack of coordination between activists and politicians. Denis Stark, the founder and leader of NMT, said the government’s lack of feedback from the public leads to profligate spending of budget funds on projects that society doesn’t even need. These grassroots movements could not only act as a voice for the people, but could also become intermediaries between business and the authorities. Groups like NMT, for example, could involve businesses in social initiatives and convince them that more environmentally friendly products are essential. NMT already works in several such areas—providing trash separation and recycling containers; holding roundtables and seminars for people who are interested in the movement; and environmental-themed corporate parties that provide the opportunity to implement social responsibility principles by jointly cleaning up areas or planting trees.